We specialize in premium outerwear, jackets, work boots, durable, and affordable work wear with the best Carhartt selection in the area. Our Carhartt line includes a full line of construction and outdoor clothing, including big & tall sizes. Dakota Workwear also carries a great selection of boots including Timberland Pro, Danner, Georgia Boots, Magnum, Lacrosse, Muck, and Wolverine brand boots and lifetime warranty Darn Tough Socks. 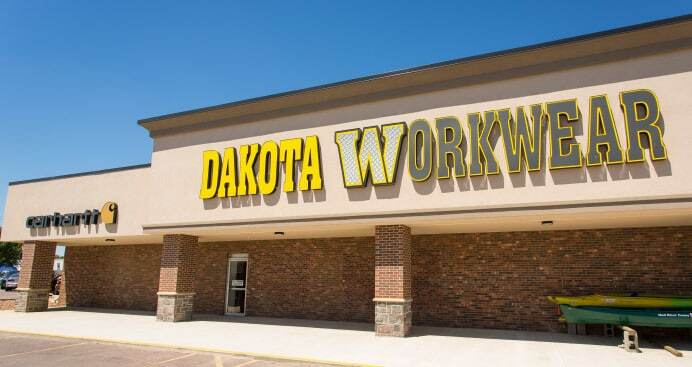 Dakota Workwear opened in September 2014 centrally located with convenient parking, and operating as a store-within-a-store under Nyberg’s Ace 41st & Minnesota location. “It just seemed natural to offer a work wear entity since it goes hand in hand with what we do as a hardware store. We took advantage of our Worldwide membership and created Dakota Workwear which features a strong presence in the work wear category,” Nyberg’s Ace President Kevin Nyberg says. The two stores use the same entrance and share loyalty programs and other offers. Personalized service, Sit & Fit boot service, proper fit, and product knowledge is the primary focus of Dakota Workwear staff.